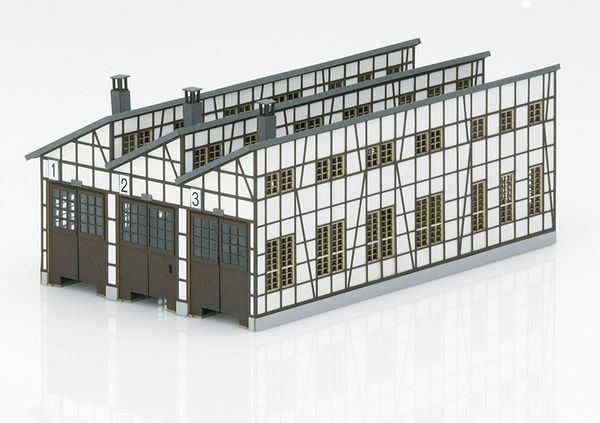 Model: "Rottweil" Locomotive Shed. This is a 3-stall locomotive shed, which can be built on next to it and behind it as desired. Four (4) of this kit are required to build the "Rottweil" locomotive shed to scale (2 kits next to each other and 2 kits for the extension). The workshop is included (prototypical facility with 5 locomotive stalls and a built-on workshop) for a prototypical structure. As an option, a 6-stall structure without a workshop is also possible. The stall doors can be opened and are ready for installation of servomotors (not included with this kit). The center-to-center track spacing will work with the 66540 transfer table. This kit consists of laser-cut, colored architectural hard cardstock. It has the finest laser-engraved details. Extensive instructions for building the kit are included. Dimensions (L x W x H) for a 3-stall locomotive shed: 168 x 102 x 67 mm / 6-5/8" x 4" x 2-5/8". Dimensions (L x W x H) for a prototype 5-stall locomotive shed with a workshop attachment (4 kits): 276 x 188 x 67 mm / 10-7/8" x 7-3/8" x 2-5/8".